A) 4.5″ 32:1 L/D RATIO EXTRUDER HAVING A SEVEN (7) ZONE ELECTRICALLY HEATED, AIR COOLED, AND VENTED BARREL AT A 64″ CENTER-LINE HEIGHT. GEARBOX HAS A REDUCTION RATIO OF 18:1 AND IS DIRECT DRIVEN IN A TUCK UNDER MANNER BY A 250 HP BALDOR AC MOTOR WITH ABB ACS800 INVERTER. TEMPERATURE CONTROL PANEL WITH 7 BARREL ZONES AND 11 DOWNSTREAM ZONES OF EURO-THERM MODEL 3216 TEMPERATURE CONTROLLERS. 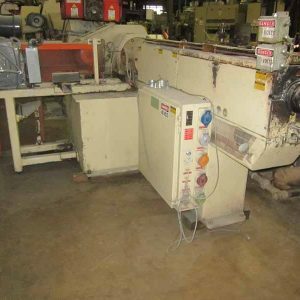 B) 4.5″ BERINGER MODEL SC4 HYDRAULIC SLIDE PATE SCREEN CHANGER WITH HYDRAULIC POWER PACK. C) MAAG MODEL EXTREX 70 MELT PUMP WITH 15 HP AC MOTOR. DRIVE IS INTEGRATED INTO EXTRUDER PANEL, S/N 50138190-10. E) 64″ WIDE COOLING AND POLISHING STAND HAVING A 16″ DIAMETER TOP ROLL, 24″ DIAMETER MIDDLE AND BOTTOM ROLL MOUNTED IN A VERTICAL ARRANGEMENT FOR DOWN-STACK OPERATION. ROLLS ARE DRIVEN VIA SILENT CHANGE A BY 5 HP DC MOTOR. ROLLS ARE AIR ACTUATED. INCLUDES DIP TANK, IDLER ROLL CONVEYOR, 64″ WIDE PULL ROLLS WITH BY 5 HP DC MOTOR AND TEMP CONTROL SYSTEM WITH 7.5 HP PUMPS AND BUILT ONTO FRAME CONTROLS. 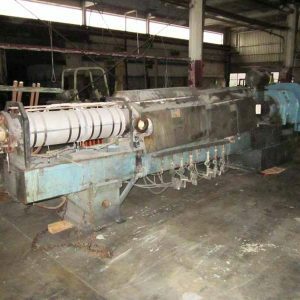 F) HOBBS SINGLE TURRET 2-POSITION WINDER ABLE TO HANDLE UP TO TO 36″ DIAMETER PACKAGES ON 3″ AIR SHAFTS. 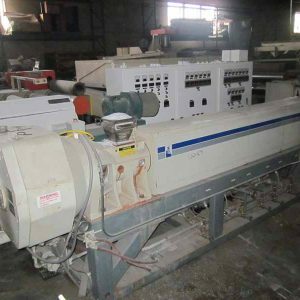 A – WELEX MODEL 3.5-30:1 LHSV 3.5″ 30:1 L/D EXTRUDER HAVING AN ELECTRICALLY HEATED, WATER COOLED BARREL (CLOSED LOOP) VENTED AND PLUGGED BARREL AT A 55″ CENTERLINE HEIGHT. 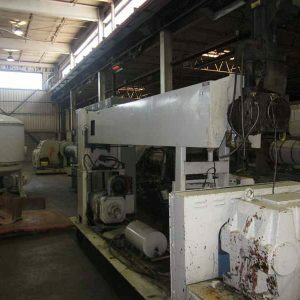 LUFKIN CHANGE GEAR GEARBOX IS DIRECT DRIVEN IN A TUCK UNDER MANNER BY A 150 HP RELIANCE DC MOTOR WITH RELIANCE SCR CONTROL. S/N 4746. MANUFACTURED 5/1988. INTEGRAL PANEL WITH CONTROLS. INCLUDES TWO STAGE SCREW AND SPARE SCREW. B – BERINGER SCREEN CHANGER HAVING TWO NOMINAL 3.5 ” DIAMETER BREAKER PLATES. INCLUDES HYDRAULIC POWER PACK. 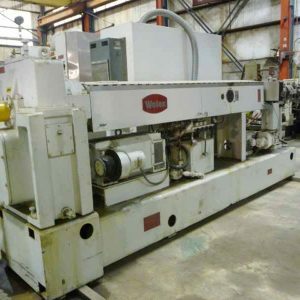 C – WELEX / MAAG MODEL 56/56 MELT PUMP WITH 20 HP DRIVE SYSTEM. 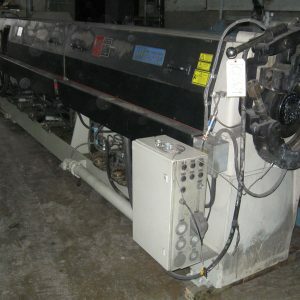 INCLUDES CO-EX BLOCK AND STATIC MIXER. 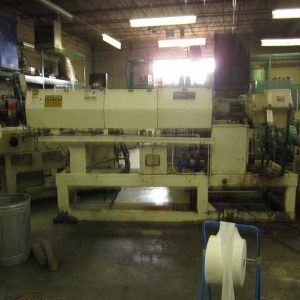 D – EDI 34″ MODEL R-75 FLEXIBLE LIP SHEET DIE HAVING A 45 DEGREE RESTRICTOR BAR AND REMOVABLE LOWER LIP. INCLUDES DIE CART. B – EXTEK MODEL HSC60 SCREEN CHANGER HAVING TWO NOMINAL 6” DIAMETER BREAKER PLATES. INCLUDES 2 HP HYDRAULIC POWER PACK. 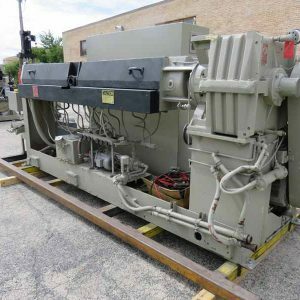 C – XALOY MODEL SPD-300 MELT PUMP WITH 25 HP DRIVE SYSTEM AND CONTROLS. D – EDI 44″ MODEL ULTRA-FLEX UHRC-100 FLEXIBLE LIP SHEET DIE HAVING A 45 DEGREE RESTRICTOR BAR. SET UP FOR FIVE ZONES OF TEMPERATURE CONTROL. WITH DECKELING PROVISION. INCLUDES DIE SUPPORT CART WITH CASTERS. 230 VOLT. S/N 98-20339. MANUFACTURED 1998. E – DAVIS STANDARD MODEL UPSTACK46 COOL-KING AND POLISHING STAND HAVING THREE NOMINAL 24” DIAMETER CHROME PLATED ROLLS MOUNTED IN A VERTICAL ARRANGEMENT FOR UP-STACK OPERATION. HYDRAULICALLY ACTUATED CHROME ROLLS ARE EACH DRIVEN BY A 3 HP INVERTER DUTY MOTOR WITH ENCODER THRU SEW EURODRIVE 86.34:1 GEARBOXES WITH A 0-1750 RPM SPEED RANGE. 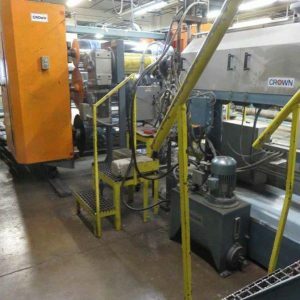 INCLUDES PULL ROLL STAND WITH 46” X 8” DIAMETER ROLLS WITH 5 HP DRIVE SYSTEM AND 20′ IDLER CONVEYOR AND THREE ZONE WATER TEMPERATURE CONTROL SYSTEM WITH HEATERS, HEAT EXCHANGERS, AND 7.5 HP PUMPS.